Hi everyone, I've created a new card using stamps from Creative Vision Stamps. I've used the Friendship to Cherish clear stamp set. 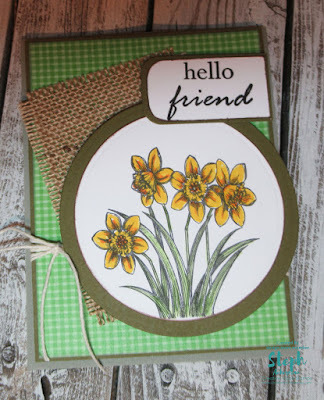 This stamp set has 4 stamps and I've used the daffodils with one of the sentiments. For additional detailing, I've matted the stamped image on a piece of burlap. 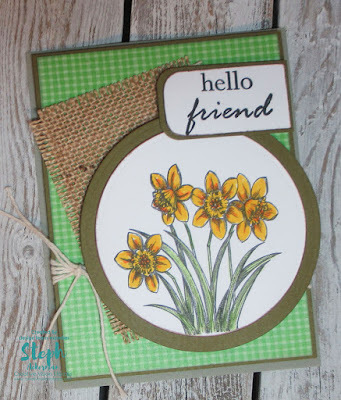 You can shop at www.creativevisionstamps.com using my code (Steph10) to receive 10% off your next order of $20.00 or more. Simply enter my code at checkout. It's valid on regular priced items only, does not count toward shipping and taxes and cannot be used with the custom stamp service.